BlackArch Partners is pleased to announce the sale of PCB Group, Inc. to MTS Systems Corporation. 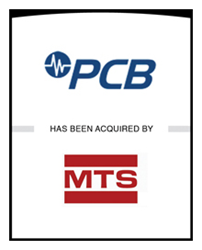 MTS Systems, a leading global supplier of high-performance test systems and position sensors, acquired 100% of PCB for $580 million. BlackArch Partners is pleased to announce the sale of PCB Group, Inc. (“PCB” or the “Company”) to MTS Systems Corporation (“MTS Systems”). MTS Systems (Nasdaq: MTSC), a leading global supplier of high-performance test systems and position sensors, acquired 100% of PCB for $580 million. PCB (http://www.pcb.com), headquartered in Depew, NY, is a global leader in the design, manufacture and distribution of piezoelectric sensors and components used for vibration, pressure and force measurement. The Company’s sensor technologies serve multiple end markets, including test and measurement, aerospace & defense, automotive / rail, energy / power generation and industrial measurement & instrumentation. PCB’s sensors enhance the performance of its customers' products and enable those products to enter the market more rapidly and reliably. BlackArch Partners was retained by PCB and its shareholders to serve as the Company’s exclusive financial advisor. The transaction serves as another example of BlackArch’s private company expertise and deep experience serving clients within the Applied Technology and Industrial Growth & Diversified Manufacturing sectors. PCB Group Inc., headquartered in Depew, New York, and founded in 1967, is a manufacturer of piezoelectric sensors, accelerometers and associated electronics for the measurement of dynamic pressure, force and vibration that enhance the productivity, safety, reliability and efficiency of their customers' products and processes. PCB Group Inc. had 1,041 employees as of December 31, 2015. MTS Systems Corporation's testing hardware, software and services solutions help customers accelerate and improve their design, development and manufacturing processes and are used for determining the mechanical behavior of materials, products and structures. MTS Systems’ high-performance position sensors provide controls for a variety of industrial and vehicular applications. Headquartered in Eden Prairie, MN, MTS Systems had 2,400 employees as of October 3, 2015 and revenue of $564 million for the fiscal year ended October 3, 2015. Additional information on MTS Systems can be found at http://www.mts.com. BlackArch Partners is a leading middle-market investment bank offering a full spectrum of advisory services to financial sponsors, private companies and diversified corporations. BlackArch addresses the needs of owner-operators, founders and shareholders of private companies with specialized services that include M&A advisory, strategic advisory and private capital solutions. Headquartered in Charlotte, NC, with offices in Houston, TX, BlackArch features a total of 12 industry-focused practices that cover all sectors of interest to middle-market investors; BlackArch professionals have closed more than 350 transactions in 16 countries on four continents. Please visit our website, http://www.blackarchpartners.com, for more details.